Sylvester Stallone is always in tip-top shape and ready to use his fists or brains. Use your own noggin to complete this quiz on Stallone and his movies. 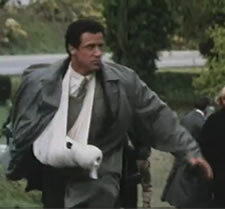 1) In which movie did Stallone's character ask "Why you pushing me?" 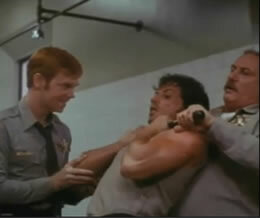 2) Which Stallone movie is this photo from? 3) Which actress played Ingrid Knutsen, the girl Cobra protected. 4) What was the name of Rocky's pet dog? 5) Which Stallone movie is this photo from? 6) What was the name of the wrestler Rocky fought in Rocky III. 7) Which Stallone movie is this theme song from? 8) Which Stallone movie did the character Freddy Heflin play in. 9) Which actor in The Expendables was a former UFC fighter. 10) Which actor did not make an appearance in The Expendables? 11) In which Rocky movie does Apollo Creed die in? 12) The character Booker is played by which of the following actors in The Expendables 2. 13) How much did Rocky Balboa weigh in at for the charity boxing match in Rocky III? 14) Rocky Balboa's trainer Mickey dies in which Rocky movie?